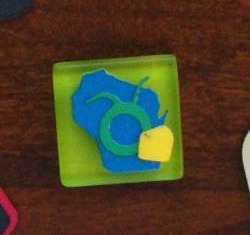 The swap at the Ohio Cricut Circle meet up was magnets. There were so many creative ideas! I doubt I got everyone's magnet but I took pictures of all the magnets I did receive and here they are! I also took a picture of the variety of backings people used to create these magnets. It was awesome how many different materials were used from vinyl to paper to mosaic tiles (that was me!). I made this using mosaic tiles (like you would use for a back splash) from Hobby Lobby. There were two different greens in my pack, this is just one of them. The tile is one inch square. I made all of my cuts and then glued them to the tile. I didn't worry too much about making sure they were all properly glued down becasue my next step was to Mod Podge the whole thing to seal it all in. This left a nice clear finish over the entire surface and I didn't have to worry about any parts falling off. For the back, I used the magnet that comes as a big roll and just cut a piece to fit. I hope you like it! I'm so bummed that didn't get to give you one of mine! Nor did I get one of yours! Sad face!! These are all so awesome! Thank you for sharing!